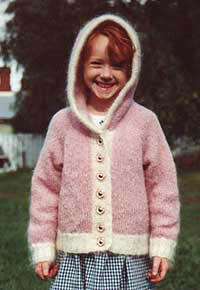 Amanda’s Question: I am currently working on a knit-in-the-round pullover to which I would like to add a hood. I’m planning to do a “kangaroo pouch” neckline (a la Elizabeth Zimmermann), then–after cutting the steek and sewing the shoulder seams–I’ll just pick up the stitches around the neck and knit the hood. So, here’s my question: I know I need to increase after I pick up the stitches around the neck, but how much? And, do I just do one row of drastic increasing, or several rows of light increasing? I know how I want to shape the top of the hood, it’s the beginning that’s got me stumped. 🙂 Any advice would be greatly appreciated! TIA! 1. With a smaller needle, reduce the neck to 45% of the body sts for an adult and complete a ribbing (2″). 2. With a smaller needle, reduce the neck to 50% of the body sts for a child and complete a ribbing (1″). In the next round: with larger needles, inc in EVERY st (except the centre front sts which you will bind off). This will give you the fullness you need. Work the hood back and forth for the depth you need. I find that a 5 st garter edge, at the beginning and end of each row, gives a nice, non-rolling, and somewhat tighter edge to the hood. When you get to the height you need, graft the remaining sts together, or play shape-the-back-of-the-hood-so-it-doesn’t-come-to-a-point. Copyright Claudia Krisniski, knitting, spinning and brushing bunnies at Countrywool in New York’s Hudson Valley. (Question originally posed by Amanda Gill) Used with permission.